Beckminster Methodist Church Penn Fields. The picture, information and research has been provided by Roy Evans who has kindly allowed me to use it here. Beckminster Methodist Church was built in 1926 and it is believed that the war memorial was installed at that time. The church was formed by the amalgamation of the congregations of the former Penn Road Wesleyan Chapel with a smaller church at Bradmore. Born the son of Charles and Ann Lymn at Oldbury on 18th August 1886, Joseph Ewart Lymn grew up to become the husband of Eva Lymn, living in Upper Zoar Street, Wolverhampton. As a member of the Royal Fleet Reserve he was on an annual two-week training exercise immediately prior to the outbreak of war and was instantly recalled to active service. As Able Seaman 218307 in the Royal Navy, Joseph was killed in action at the age of 28 years on 1st November 1914 when his ship HMS Good Hope was sunk at the Battle of Coronel (named from a small town on the coast of Chile off which the battle was fought) by the German battleship Scharnhorst at around 2000 hours on 1 November 1914. Although only 12 years old, the armoured cruiser Good Hope was slow and out-gunned compared to the modern German ships of the day and 90% of it’s crew were reservists. The Good Hope was hit many times and was ablaze from stem to stern before finally sinking. HMS Monmouth was sunk in the same engagement, a total of over 1,500 men losing their lives in the two ships. In contrast the casualties aboard the Scharnhorst were reported as two men wounded. Joseph’s body was lost at sea and he is officially commemorated on the Portsmouth Naval Memorial, Hampshire. He is also commemorated on the family grave marker in St. Phillip’s churchyard, Pennfields, Wolverhampton. Buried in that plot along with other family members is his son Joseph Jellicoe Lymn who died on 17th September 1914 aged only 17 days and whom his father would never have seen. The loss of her baby and her husband in such a short space of time proved too much for Eva who suffered a nervous breakdown, leaving her other son Kenneth to be raised by his grandparents. 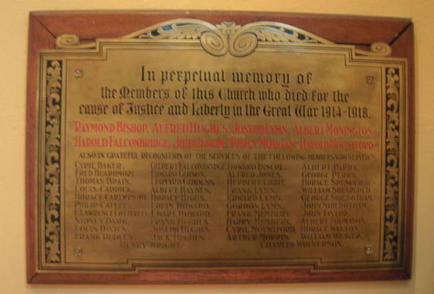 Joseph’s 3 brothers Frank, Edward and Gordon also appear on the church memorial as having served. The husband of Beatrice Monington, of 12 Retreat St, Wolverhampton, Albert had been an Insurance Salesman before volunteering for service at the outbreak of war and becoming Private 10300 in the 7th (Service) Battalion of the South Staffordshire Regiment. Albert’s Battalion took part in the ill-fated Gallipoli campaign, named after the Turkish peninsular on which it was fought. After several months of training at Grantham, Notts., they set sail from Liverpool on 30th June 1915, arrived at Gallipoli on 21st July, and three days later went into the trenches. The battalion suffered heavily on the 9th August when they had 9 officers killed and 7 wounded as well as 123 men killed or missing and further 206 wounded. Albert survived this action only to die a few days later on 22nd August, aged 34 years. They had spent the night of the 20th on the beaches in preparation for another assault on the Turkish positions, their main objective being a strong point known as Hetman Chair. At 3.00 p.m. on the 21st, naval guns commenced their bombardment, and half an hour later Albert’s battalion moved out in support of the main attack. As they moved across open ground they came under very heavy machine-gun and shellfire and although they had not got properly into action, they had sustained heavy casualties. In a short time, all but 2 of the officers were casualties and some 300 ‘Other Ranks’ were killed, missing or wounded and after being pinned down for many hours the attack completely failed. The remnants of the Battalion withdrew on the 23rd. In less than two weeks more than half of the battalion had been killed or wounded. Raymond was Private 25046 in the 1/7th Battalion Royal Warwickshire Regiment. Born in Quinton, Gloucestershire, he was the son of George and Jane Bishop of 36 Burleigh Road, Wolverhampton and died on 27th August 1917 aged 22 years. Heavy rain during the night made the ground even more difficult and when they eventually attacked, after having spent several hours in waterlogged shell-holes, they found the ground almost impassable and their attack floundered in the mud. 30 of Raymond’s comrades died with him that day. Raymond has no known grave but is officially commemorated on the Tyne Cott Memorial, Zonnebeke, Belgium. Born to Fredrick and Florence Falconbridge at Standish near Wigan on 19th September 1896, Harold was to die the day after Raymond Bishop. Harold and his family had moved to Wolverhampton around 1902 and he became a pupil at Bingley Street School. At the time that he volunteered as Private 24746 in the 2nd Battalion of The South Wales Borderers, they were living at 35 Cardiff Street, Wolverhampton. After first seeing service at Gallipoli in 1915, arriving there on the same day as Albert Monington and Percy Morgan, Harold moved, via Egypt, to France and Belgium, where he was badly wounded in the chest by shrapnel, probably during fighting on 16th August 1917 near Boezinghe, just west of Ypres in Belgium. He was repatriated, only to die of his wounds at Morden Grange Hospital, Surrey on 28th August 1917 aged just 20 years old. Harold is buried in Jeffcock Road Cemetery, Wolverhampton where his father was employed as Sexton Grave Digger & Gardener and may well have dug his own son’s grave. He was to bury his wife Florence in the same grave some 21 years later. Harold’s younger brother Gilbert survived the war having served in the Royal Army Service Corps and is also given a place on the church memorial. The son of Albert and Susan Inscoe of Lorne Terrace, Church Road Bradmore, when he died John Inscoe was Gunner 31730 of the 62nd Trench Mortar Battery, Royal Field Artillery. Although normally attached to the 62nd West Riding Division, which had only arrived in France in March 1917, two Companies, 'Y/62' and 'Z/62' Trench Mortar Batteries were seconded to the 50th Division for a raid carried out on September 15th that year. Their position was in a little-used trench about 150 yards behind their own front line opposite Cherisy in the Arras area of France. This trench had previously suffered very little from the German barrage, and it was expected that casualties there would be slight. In the event, this trench received about 75 percent of the total German Barrage that day. Earlier John’s Battery had had few casualties, but now they suffered severely. Around one gun were grouped about a hundred bombs ready for firing, and exactly what happened we shall never know, but at 7.40 pm. the whole lot were detonated. There would have been nothing left for his comrades to bury. He was 21 years old. John’s elder brother Howard is also on the church memorial as having served. John is officially commemorated on the Arras Memorial. Although a native of Wolverhampton, born on 14th October 1896 at 93 Lime Street, Harold William Mountford, the eldest son of Alfred and Alice Mountford enlisted in the army at Lichfield and became Private 27387 in the 12th Battalion the Prince of Wales’s Own (West Yorkshire) Regiment. At 6-28 a.m. on 20th November 1917 Harold’s battalion began an attack on the enemy trenches at Bullencourt, near Arras, and 67 minutes later they had taken all of their objectives. Harold and 11 comrades died in the attack. Harold has no known grave and like John Inscoe is officially commemorated on the Arras Memorial. Harold’s brother Cyril is shown on the church memorial as having served. The only son of James and Annie Morgan, Percy James Morgan was 22 years old when he was killed in a flying accident at Fowlmere, Cambridgeshire on 17th July 1918. Percy had lived at 24 Cardiff Street, Wolverhampton and had been a pupil at Wolverhampton Grammar School before going to work at the Sunbeam Motor Car Company. Volunteering at the outbreak of war, he joined the 7th Battalion South Staffordshire Regiment and would have served with Albert Monington at Suvla Bay, Gallipoli but returned to England after having the roof of his mouth shattered by a sniper’s bullet that had already killed the man beside him. After recovering and spending a period of time on sedentary duties he joined the then newly formed RAF where his engineering skills gained him the rank of Air Mechanic First Class in 124 Squadron. Percy met his death as a passenger in a DH6 training aeroplane being piloted by 2nd Lieutenant Osbert Calverley, a 19-year-old Canadian, when they collided with a DH9 machine piloted by another Canadian, 30 year old 2nd Lieutenant William Lanigan, their machine was destroyed by fire. All three men were killed. Percy is buried in the family plot at St Phillip’s Churchyard, Pennfields, Wolverhampton. The headstone shows that Percy had known much tragedy in his short life. Buried in the same plot are his sister who died on 29th November 1912 aged 10 years, his father who died on 23rd March 1913 aged 41 years and his mother who died on the same date one year later aged 40. Research is still continuing into this man.